At least two people dead and more than 100 injured – this is the way Xstrata does ‘community relations’ in Peru. Meanwhile the mining company’s boss Mick Davis is in line for a $44 million pre-merger bonus. Stephanie Boyd reports from Cuzco, Peru. The Swiss mining giant Xstrata has refused to negotiate a new social contract for its Tintaya mine in Peru, leading to a province-wide strike with at least two deaths, over 100 wounded and the declaration of a state-of-emergency. While farmers in one of the country’s poorest regions are under siege by hundreds of police commandos, Xstrata officials in Europe celebrate a $90 billion merger with London-listed commodities giant Glencore. With the festivities underway, Xstrata clearly doesn’t have time to consider petty requests from its Peruvian mine, like improving environmental monitoring or social policies. But the company can dig deep and reward its chief executive officer, Mick Davis, with a ‘bonus package’ worth tens of millions of British pounds, as part of the Glencore merger. Is this what Xstrata means when it promises, on the company’s sleek web page, to ‘balance economic, environmental and social considerations’ in its administration? ‘Community relations’ seem to have gone back to the Dark Ages under the new Xstrata-Glencore regime. Political leaders in Espinar – where the Tintaya mine is located – chronicle a frustrating series of attempts to bring the company to the negotiating table over the past year. Finally, on 21 May they declared a provincial strike to pressure the company and government to sit down and talk – or at least acknowledge their existence. Don’t be mistaken: this is not a case of a community trying to close down a mine or block a new project. The people of Espinar have lived with the mine for 30 years. They want improved environmental monitoring, cleaner technology and independent management of the mine’s community development fund. For this, they have been labelled unreasonable and belligerent eco-terrorists by Peru’s mainstream press in the nation’s capital. During the first eight days of the strike, thousands of protesters blocked access routes to the mine. The government sent in hundreds of DINOES officials – special police commandos trained in counter-insurgency and anti-terrorism. These heavily armed officers were sent to ‘subdue’ peasant sheep farmers, resulting in at least two deaths, over a hundred wounded and more than 20 persons detained inside the mine’s compound without due process. On 28 May, Peru’s president Ollanta Humala declared a state of emergency for 30 days, suspending constitutional rights and civil liberties. The government reasons that by depriving citizens of their human rights, they will somehow restore ‘peace’ to the zone. Photo: Provincial Governor of Espinar Oscar Mollohuanca has been arrested and charged for crimes linked to the strike. Stephanie Boyd is a writer and filmmaker based in Peru. Her films include The Devil Operation . 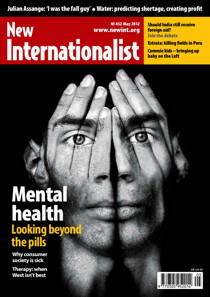 For more see ‘Xstrata’s killing fields’ in the May issue of New Internationalist.